Detective stories in comics is something straight from the early days of the medium, hell everyone knows Batman got his start in Detective Comics... and everyone loves a good mystery... a well crafted one builds intrigue withing the story to make you want to see the resolution. And of course I have to talk about Renegade Press... and I have to thank Ms Deni Loubert for helping with the history of it. Renegade was a spin-off of Aardvark-Vanaheim that originally began as a company to publish a Canadian comic book title Cerebus by Dave Sim. Sims and Loubert co-owned the company and were married shortly after they began doing Cerebus. They began to do a short feature in the back of the comic that featured comics they loved, Ms. Tree being one of those. The ones that got great response were sometimes spun off into their own title. Ms. Tree was among a small number of titles they published to introduce their audience to comic book artists they enjoyed and thought needed more exposure. When Sims and Loubert split up he decided to return AV to it's original inception of a singular title company and she took the other titles with her to form Renegade Press. At it's height They were handling 13 titles, most bi-monthly as well as negotiating foreign language and media deals for all of their titles. Ms. Tree was always under option for film or TV development when it was at Renegade. They closed shop in 1989 not long after the sudden drop in support for black and white indie comics (often referred to as Black October) when it became impossible to financially continue the company. So history lesson over, let's get to this week's comic shall we? Cover: The cover is very very blue... it's actually a cracked image of our lead character, Michael Tree looking out at the reader, with Heroine Withdrawal printed across the bottom. Writer: Max Allan Collins... and you may be wondering why I didn't talk about him and Terry Beatty up above... well... it's because 5 years after coming up with the character, they were still involved with the book, even has it has changed publishers hands a couple of times by 1986. Anyway onto Mr. Collins, and he has had a very long and very extensive career... he has many literary works to his credit, but focusing on his comic, he's worked with a lot of independent publishers and the big names, like Dark Horse, DC Comics, IDW and Marvel. Some of the books he's worked on include several CSI miniseries , Batman and Action Comics. Beyond comics, he's also done novelizations for movies, one of my favorites being Air Force One. Penciler: Terry Beatty, obviously the co-creator for Ms Tree as noted before he has a large body of work, including work on a lot of comics based on various animated Batman shows... obviously he's worked for DC, he's also done with with Image, IDW some minor stuff with Marvel. He and Collins have had a long association beyond Ms. Tree, as they have teamed up for things like Mike Mist, Mickey Spillane's Mike Danger and Johnny Dynamite. Plot: Called 'By Reason Of Insanity' Ms Tree agrees to go into a psychiatric hospital as part of her plea deal to convince the doctors of her sanity, however while in the hospital she encounters another resident who saw a murder that is tied to a Senator looking for re-election. It's told over the course of the book, with a big portion of it showing her sessions, we see where she meets the other patients and the big reveal of what he saw is told at the end of story. Nice solid story progression. Positives: This is a great example of a Black & White Independent comic, where the story and the art work have to carry things forward. 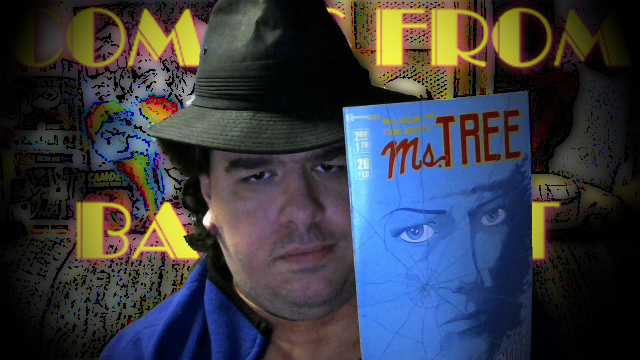 There is very little wasted space and even if you picked up this issue at random, having never read Ms. Tree before, you are brought up the speed and get caught up in the story in short order. It makes you want to seek out the previous issues and and the following issues to see more of the story, which is important. Negatives: No real negatives here, but its more an oddity, with the 'Mike Mist' Minute Mystery that is in the middle of the comic. It's a fine two page comic strip, but its placement in the middle is just breaks up the main story too much in my opinion. What's Cool To Me: Renaming this little portion, As, it's just what I call this particular section for things that stand out, and it's one the inside over, an editorial from publishers Deni Loubert, regarding a case for reading, and combating illiteracy would be a good way to cut down on a lot problems with people falling into the traps of drugs and alcohol abuse. I did ask if this was Ms. Loubert's signature to include these editorials, and she confirmed that it was, she started including doing them in Cerebus and continued with the books under Renegade banner. Awesome stuff. Well that just about wraps things up here... I again want to thank Ms Deni Loubert for her assistance with the history background I included in this review. Thanks for the nice overview of the comic Fred. Just as a side note, Terry Beatty is the current artist on the comic strip Rex Morgan, so you can see his work there every day. Thank you Ms. Loubert, I greatly appreciate it. And thanks also for where Mr. Beatty's work can be seen on a regular basis!